Extreme weather events as a result of climate change represent a “national security issue” that will continue to hinder U.S. Department of Defense operations and promote regional instability over the next 20 years, a recent DoD report to Congress confirmed. Titled “Report on Effects of a Changing Climate to the Department of Defense,” the report underlines significant risks as well as certain DoD priorities to tackle these concerns and build greater resiliency of its facilities and logistic networks. 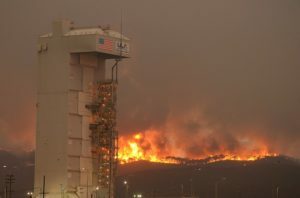 While it does not offer any conclusions as to the causes of climate change, the report does reveal that climate change is a central concern of the DoD and will increasingly pose a threat to its global operations moving forward. Specifically the report affirms that 79 installations are at significant risk of recurrent flooding, drought, desertification, wildfires, or thawing and permafrost. Note that the DoD prioritizes these bases based on their operational role and overall importance and therefore the number may include other unspecified bases. Tellingly, this may serve as the primary reason for why the report excluded Marine Corps facilities. Importantly, however, the 79 bases have already experienced extreme weather events that are increasing in severity. 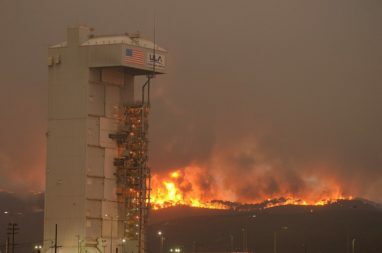 A few examples included in the report are various incidents of flooding at the Joint Base Langley-Eustis in Virginia as well as recent fires in 2017 and 2016 that encompassed parts of the Vandenberg Air Force Base. The report notes the indirect side effects of extreme weather events that are predicted to produce transnational crises. Foremost among the DoD’s concerns regards the operational areas of both the United States Africa Command (USAFRICOM) and Indo-Pacific Command (INDOPACOM). The report also highlights that weather conditions may obstruct the Department of Defense’s logistics and mission support operations oversees–namely intelligence, surveillance, and reconnaissance (ISR) operations over the Mediterranean Sea region that service both Europe and the North Africa region. Moreover, the increasing open access to the Arctic Ocean as a result of a rise in ocean temperatures may lead to a race between the U.S. and its adversaries in the region. To mitigate these concerns, the Department of Defense posits that it seeks to (1) increase installation resiliency and (2) expand research grants through its Strategic Environmental Research and Develop Program (SERDP) and Environmental Security Technology Certification Program (ESTCP). Yet, the report notes that more cooperation is needed with U.S. allies to further enhance the resiliency and sustainability of U.S. military and humanitarian operations abroad. For resources and information on climate change issues, please see the HSDL featured topics section on climate change.